I haven't done much with this set since it jumped off the rack at A.C. Moore and just made me buy it. I still think these are beautiful images - just having a little trouble doing them justice. 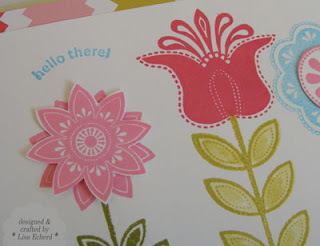 So here are some of Hampton Art's Fabulous Flowers in traditional card designs. This second one is a fairly non-traditional color combo at least for me: Purely Pomegranite, another burgandy/red, periwinkle blue with some black and white for neutrals. I'm adding this to my 'guy' card stash. 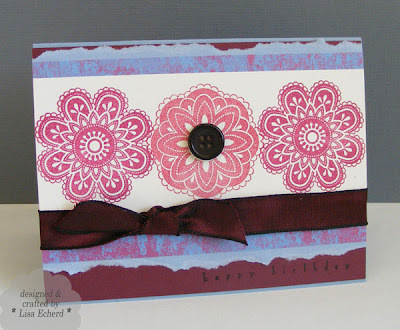 I used a couple of the Colorbox chalk inks (Rouge and Warm Red) for the pink and red flowers and just love them more and more. 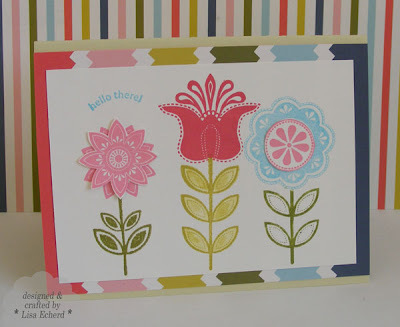 It did look like these flowers were going to visually topple the leaves and stems so I colored in the leaves with a blender pen and a little matching dye ink in Kiwi Kiss. Ink: Rose Petals fluid chalk inks from Colorbox; Purely Pomegranite, Tempting Turquoise, Basic black from SU! Ribbon and button from unkown sources.